‘Lodewijk’. 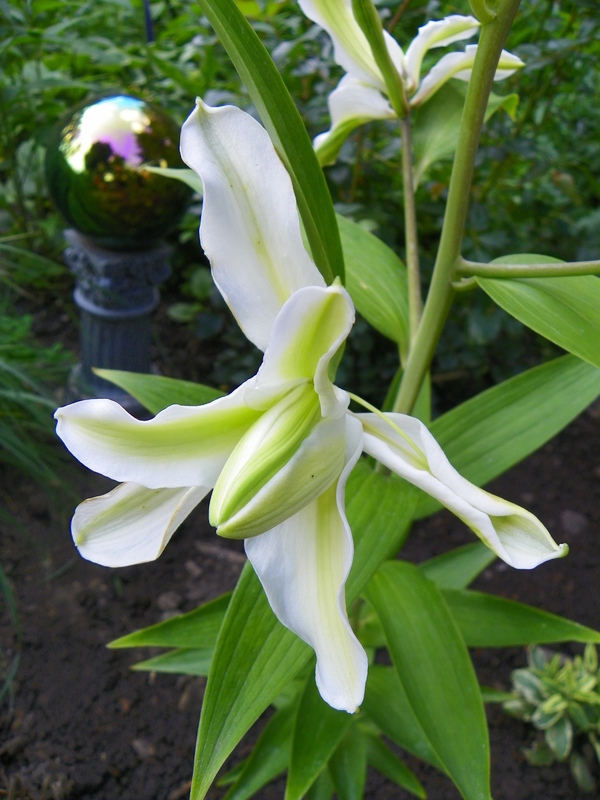 A double-flowered, Oriental, hybrid Lily. Named for Lodewijk Napoleon, or Louis I, the brother of Napoleon Bonaparte. It is 3- to 4-feet tall and blooms in July. 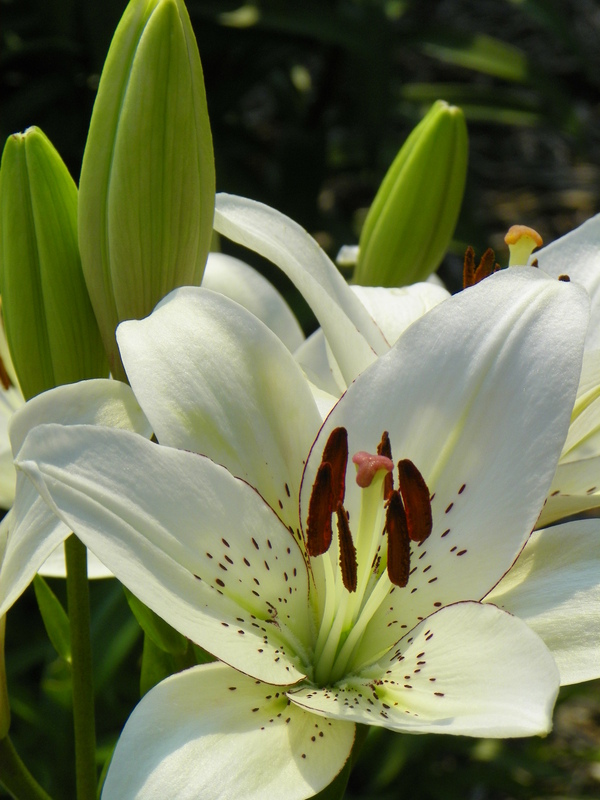 Several years ago, I focused my July Obsessions column in Northern Gardener magazine on the divine east-metro gardener Michelle Mero Riedel and her love of lilies. She opened me up to the splendor of the flower that I had previously viewed as maybe a bit to0 futzy for my personal garden taste. Now I am hooked. 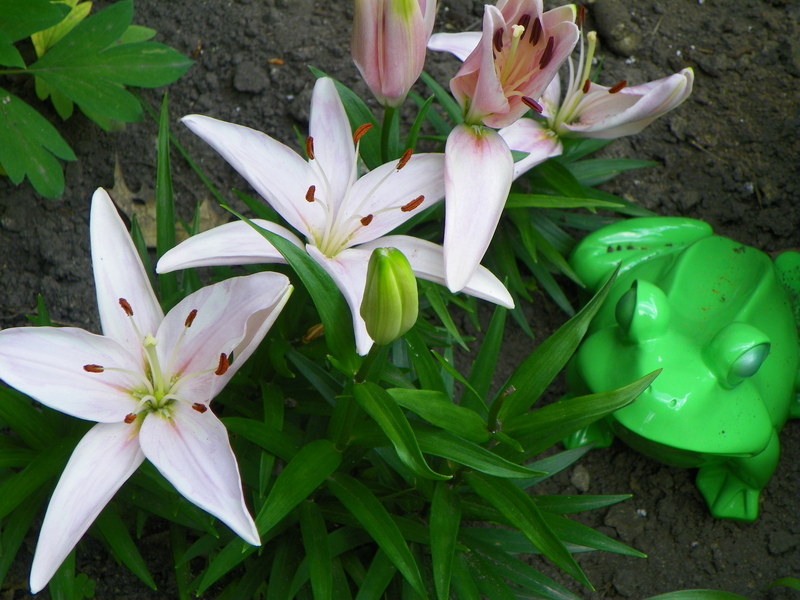 Lilies bring joy and intricacy and surprise to your perennial bed and there is a lily for every taste. There are even manly lilies. Check out the article. Michelle really does a splendid job of presenting a primer on her beloved perennial. 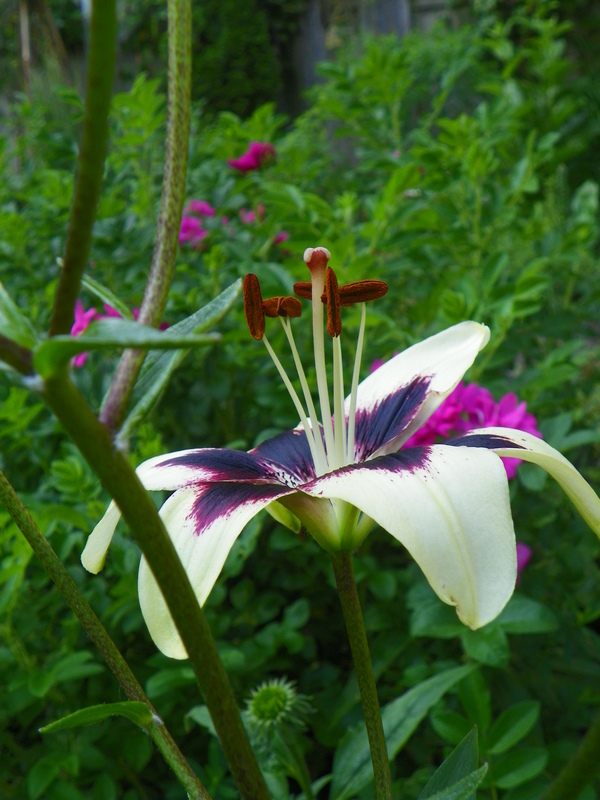 Lilium “Black Spider”. An Asiatic lily with creamy white/butter yellow blooms with deep burgundy-red spots that fill in to solid burgundy spider in the center. I fell in love when I found it in Elizabeth’s garden and planted it last fall and this summer it’s going to town! 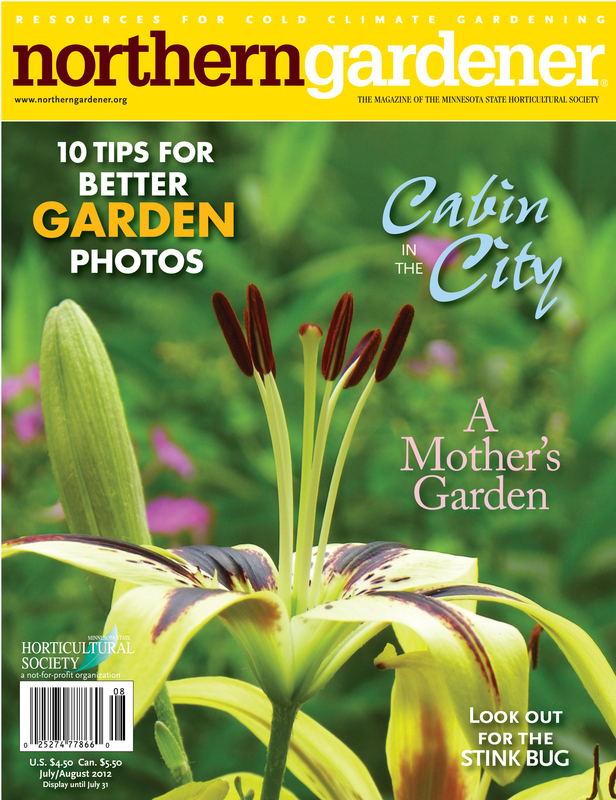 “I got the cover, Mom!” My photo of ‘Black Spider’ on the cover of Northern Gardener magazine. Two years ago when I profiled the great Bloomington gardener Elizabeth Hamilton she also sang praises of the lily in her perennial beds. She spoke specifically of the pizzazz they add to the garden, while taking up little space. You can literally stick them in here and there amongst existing plants and they will travel up and put on their show in mid-summer and then recede to the background. The little dwarf varieties pull focus to the front of the border. Variety unknown, but lovely when paired with kitschy frog. Is bold red your style? 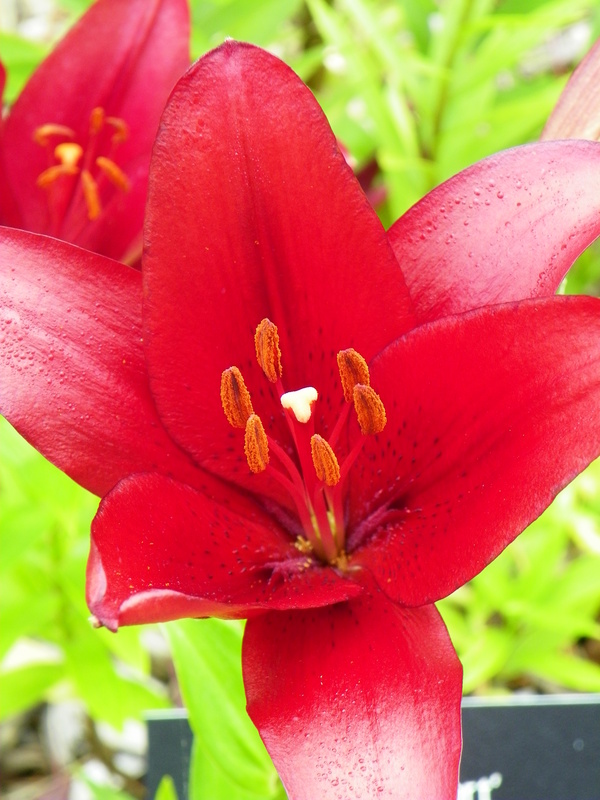 ‘Red Alert’ – Asiatic Lily. True, they love full sun, but if you cheat a little and plant them in part-sun, they simply lean over and find their light, like a true star; a diva of the garden. Plant your lilies in well-drained soil and water well when buds appear and they will stand tall and sing their beauty, like a choir of cherubs in your yard. A little basic garden fertilizer or compost scratched in, in the spring will give them a boost. It’s pretty easy to see where ‘Eyeliner’, the Fragrant Asiatic Hybrid Lily gets its name. Now is lily time and they are on sale and blooming in the garden centers. You can pick a beauty up for less than $10 and see the flower you are getting and take them home and plant them in your yard for instant gratification. Look for the pockets of dullness in your perennial border and plant a lily there and you will be increasing your perennial garden’s face value exponentially. Go out and get yourself some lilies. Check out the profile on Michelle for more lily basics. Previous Post I love you ‘Daniel Deronda’ clematis, but how in the hell do I prune you? The Black Spider is amazing.